There’s a lot more behind a military landlord/tenant relationship than simply having a good or bad landlord or tenant. And I think that it’s safe to say that we can get ourselves into trouble when we overgeneralize the situation. There are likely reasons why your landlord comes across overbearing or your tenant appears to be unresponsive. While understanding both sides of the landlord/tenant relationship might not make the irritations go away entirely, it can help you understand where the other is coming from and approach the relationship less emotionally and more logically. 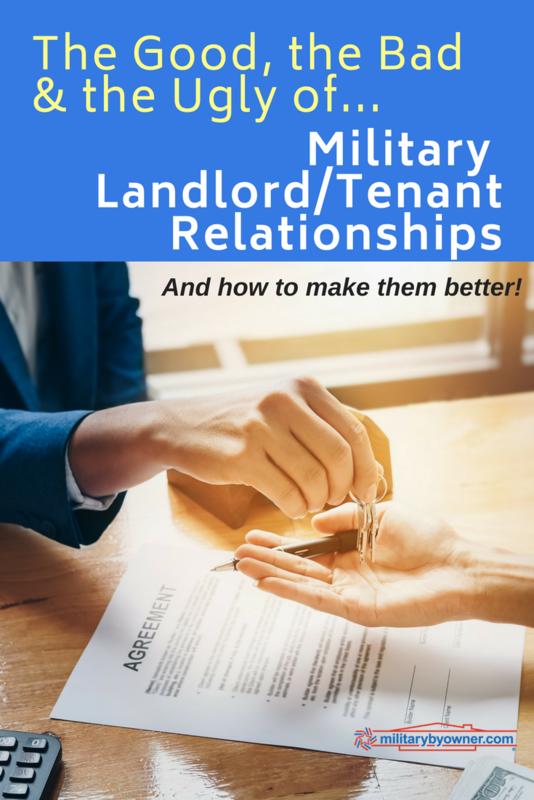 So let’s take a look at both sides of the equation and hear a few testimonies from your fellow military landlords and tenants to get a well-rounded perspective. Military landlords bring a huge financial investment to the table. Maybe they purchased a home near their duty station, and now they have orders to PCS. They’ve chosen to rent out the property, either because it was a bad time to sell, they wanted an additional source of income, or because they hope one day to return to it, so they’re entrusting their home to someone else temporarily. They expect the tenant to live in the property and care for it in the same manner they did themselves. The problem is, not everyone does. And what’s even more difficult is the fact that they likely live hundreds, maybe even thousands, of miles from the property, which means that they have even less control over the property than the average civilian landlord. Sure, they can hire a property manager to be present. But even then, they’re still forced to trust someone else to maintain the home. Then there’s turnover. Even though they’re military and understand the frequent PCS moves, military landlords have to deal with finding a new renter when their military tenant gets new orders. They have to make repairs or updates on the property, get current photos, create an online listing, and then find a new tenant. With the help of a property manager or not, this process can be stressful when there’s a mortgage payment calling their name in addition to their current housing expenses. But it’s not all bad. Real estate can be a great financial investment. And with good tenants, the right property manager, or lots of experience themselves, landlords can turn a profit. It’s those positives that help many military landlords overlook the frustrations and keep their investment in the real estate industry. For whatever reason, whether their PCS orders are short-term, the location is less than ideal, or they’re simply not ready to buy a home, military families seek temporary housing by renting someone else’s home. And here’s what you need to know. Tenants won’t feel as strongly toward your home as you do. It’s nearly impossible to make an emotional connection when it isn’t their financial investment or within their power to replace the brass fixtures and tear out the carpet. But don’t mistake a lack of ownership as disrespect. Good tenants won’t leave water leaks unmentioned, neglect stains in the carpet, or tear up the yard. They will respect the property and leave it in better condition than it was in when they signed the lease. As long-time military renters, we’ve had some great landlords and some that we’d never recommend—even to the woman that cut us off in traffic yesterday. If you’ve rented, you know that it can be challenging to create privacy as a tenant. You live in a home where someone else (who you probably don’t know very well) has a key. Even though the state laws and lease protect you from unannounced entry, that fear is often in the back of tenants’ minds. Take me, for example. I hopped off my online writers’ meeting one morning (early) to find men walking around in my fenced-in backyard. Once I realized that our landlord was among them, I raced back there to find out what was going on. He said that there was some confusion and that painters were there to paint the property. But it wasn’t his confusion that made my blood boil. It was the fact that even though there was miscommunication, my landlord let himself, along with five other men, onto the property instead of knocking on the door first. That same landlord failed to abide by the HOA rules in the community, which resulted in a restriction of access to the neighborhood pool—something that was listed in the home advertisement and influenced our decision to rent that particular home. Though I could easily fill this whole section from my experience alone, I brought in a few other stories from military renters. “It was a lovely little house amidst an idyllic Midwestern neighborhood. However, the previous tenants were facing eviction and not in a good mood. From room to room, the departing renters left a considerable mess. Honestly, I’m not sure the overwhelming herbal smell would even appeal to Snoop Dogg. Also, a sizable crimson red stain on the beige carpet made me worry that this address had recently been tied to a murder scene. Thankfully, the apologetic landlord was quick to assist with a thorough interior clean-up, and our move to this spot went smooth;y. With as many challenges as there are with renting a home at a duty station, there are a ton of perks. Renters don't have the financial burden of maintaining the home or the responsibility to find a new tenant when they move. So what we do with this information? We learn from it. Based on the stories shared above, we can walk away with a few lessons to think about. Always check the credit score of your prospective tenants. Whether you choose to hire a property manager or you’re handling the property yourself, set a minimum credit score requirement to ensure that prospective tenants have a history of financial responsibility. Use the right property manager. Your property manager can make or break your experience as a landlord. Without a professional you can trust, your hefty financial investment assumes greater risk. Make sure you’ve got someone on your side who will maintain the home to your standards by choosing responsible tenants and communicating with you honestly about the property. Ask for receipts. If you’ve offered to reimburse the tenant for a repair they’ll make themselves, get a copy of the receipt. Same goes for property managers. Even if they have a fund to draw from, you’ll want to establish accountability by requiring receipts and documentation of repairs and maintenance. This not only ensures that your money is being spent appropriately, but also that the work is being completed. Request new locks and keys. Avoid Mary’s situation above and request that the landlord provide new locks and keys and resets any keyless entry points. No one wants the unwanted surprise of previous tenants showing up at the property, much less entering. Get it in writing. If the landlord promised any updates like paint, carpet cleaning, or the repair of appliances as a condition of your lease, get it in writing. Conduct a thorough walk-through. As much as a landlord should want a walk-through, tenants do, too. Writing down every imperfection you notice prior to move-in will help protect you from unwarranted charges upon move out. Lastly, both parties need to establish expectations. What’s expected of the tenant if an appliance breaks or if the landlord needs to make a repair? How often should you check in? Try to establish trust by talking about your communication styles. Some landlords like a lot of communication, while others don’t want to be reached out to unless something is wrong. 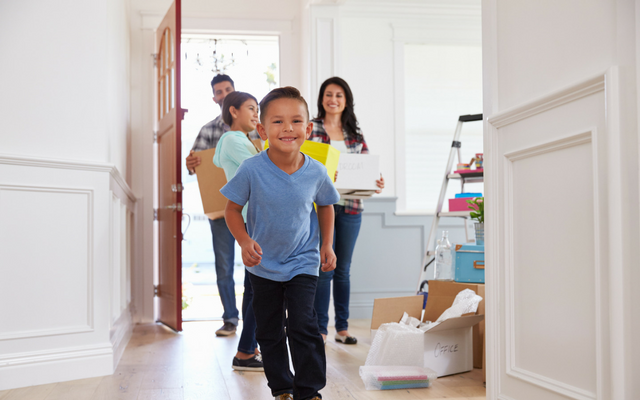 As you or your tenant prepare to make another PCS move, use these tips to establish a healthy landlord/tenant relationship. And if you encounter frustrations, keep these stories in mind to maintain a bigger perspective and help you brush off the little irritants. Do you have your own landlord or tenant story you'd like to share? We'd love to hear it. Share your experience or tip in the comment section below! Landlords, take a look at the tips below to make your property transition as seamless as possible! Then feel free to share by copying and pasting the code in the box.